On average more than 40% of the total energy consumption of the house is covered by heating or the cooling devices. 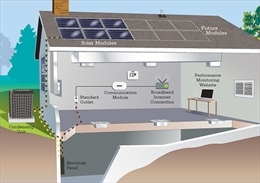 The energy consumed by the house depends on its location, area and the types of device used to heat or cool the house. Not a large amount of energy will be required to cool the house that is properly insulated. Different types of devices are used to heat or cool your home properly. It is more complex or difficult to cool the room then to heat it. Air conditioners are used to provide cooling to the house. Air conditioners don’t generate they heat they do the work of transferring the heat outside the house. These types of systems are designed to cool the entire house. This system consists of the outdoor unit and the indoor air handler unit. Air is drawn by the outdoor compressor and the air is cooled by the indoor unit with the help of refrigerant and this cool air reaches inside the house with the help of ducts. Heat pumps are similar like central ACs only difference is that they can also be used to cool the house. These types of air conditioner are suitable only if you want to cool the entire house. Work done by both type of ACs is same. Portable air conditioners are different from evaporative coolers. Portable air conditioners do not require any permanent installation. They can be used in any part of the house. However portable ACs are used only in small rooms or to cool a particular place. Ductless air conditioners are more suitable for the houses which do not have a duct work installed. 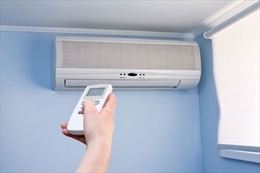 Ductless systems are useful if you want different temperature at different rooms. The compressor of the ductless system is also located outside the house however in this system each room has its own air handler unit. However ductless systems are more expensive than a central air conditioner. Heating a system costs less than cooling a system. there are different types of technologies that are used to heat a house. Different types of heat pumps use different sources of heat like air, water and underground heat. In furnaces fuel is used as the medium to generate heat. Heat is generated by fuel combustion. The burner of these systems is present inside the heat exchanger. These heat exchangers do not allow the by-products of the combustion to enter the stream. There are different types of safety devices installed which don’t allow the fuel or gasses to be accumulated in case of failure of ignition, or venting. Different types of gases used in these systems are natural gas, propane gas or oil gas. In heat pump and furnaces heat is carried inside the house along with hot air. In boilers air is transferred in hot water. Hot water gives heat to the heat radiators. These systems are also termed as hydronic systems. Small space heaters are used to cool a particular room instead of heating the whole house. These heaters are cheaper to buy but consume high energy. In these heaters heat is transferred through the bars and instead of heating the air of your room these systems directly provide heat to your body and the components present inside the room. These heaters are used to cool small rooms and can be controlled with the help of thermostat. Gas fired heaters are also popular they can be fixed on the wall or they can be free standing. These systems work on natural gas, propane gas or kerosene. These air heaters are less expensive to buy but consume large amount energy. In these systems electric current from the wall is directly converted into heat energy. No matter which type of heating or cooling device you house for the proper temperature to be maintained inside your house make sure you follow the below given tips. •	Cleaning your air filters of your central air conditioners. •	Air conditioner, heat pumps or furnace of your room should be of proper size. •	Your duct work should be cleaned and free of leaks. •	Your home should be properly insulated. •	It is necessary to call a HVAC professional to come and inspect your system at least once in a year.